Police have released footage of the shocking moment a hitman tried to take out an associate of a New York City crime family. 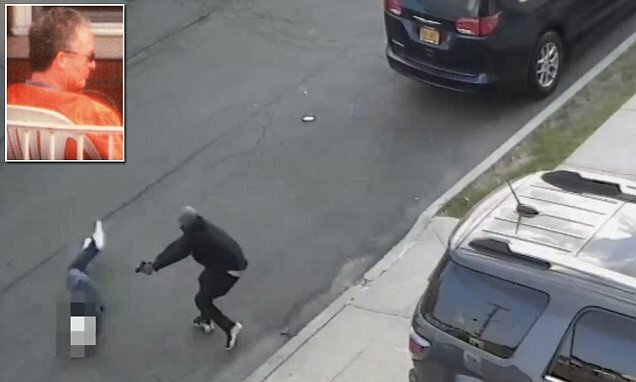 Salvatore 'Sally Daz' Zottola, who has a relationship with the notorious Bonanno family, is seen being shot at on the street near his Bronx compound about 6.30am as he tries desperately to get away. Moments before the gunman pulls up in a red four-door sedan, Zottola is seen exiting his car from the driver's seat and rolling around on the road. The gunman jumps out of the passenger seat, chases him behind the car and fires several times at his writhing body before sprinting back to the car and speeding away. Zottola suffered several gunshot wounds to his chest and left hand, as well as graze wounds to his head, police said. After the shooting, he was taken to Jacobi Medical Center in a critical but stable condition. The 41-year-old lives in one of three homes reportedly owned by the Zottola family at the end of the street, The New York Post earlier reported.